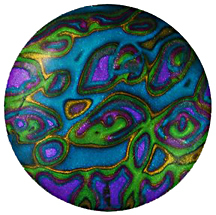 This is just a reminder that I’ll be teaching my new mokume gane technique at Creative Journey Studiosin Buford, GA (near Atlanta) in just over a week. I’ve been experimenting with this technique for over a year and have only introduced it to the public in one workshop in Colorado (outside of my studio classes). These are just a few of the ways I’ve been using this technique. 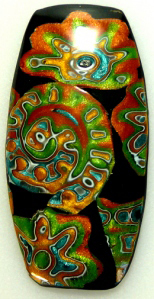 The technique uses only metalic/pearlescent clay along with black, and occasionally white. I would have taught it sooner but Polyform made major changes in their line of metallic/pearlescent clays and I had to experiment all over again. It took quite a while to get used to the differences, but now I’m happy with my results. This workshop will focus on leaves, but as you can see, there are lots of other things on could do with the technique. As an added bonus, we’ll be using my new polymer clay slicer! Hope you can join me. I won’t be teaching this workshop again until Europe in the fall. This entry was posted in Cane Slicer, Classes/Workshops, Metallic Clay, Premo Clay, Technique and tagged Carol Simmons, Color, Color Mixing, Kaleidoscope Canes, polymer clay, Polymer Clay Classes, Polymer Clay Colorado, Polymer Clay Teachers, Polymer Clay Techniques, Polymer Clay Workshops. Bookmark the permalink. Love your work – I am amazed you got the color intensity shown in your pieces with the new formulas of Polyform’s clay. My creative process has come to a halt b/c of their changes. I am quite upset with them – I have, in writing, their outright DENIAL that they reformulated things, and tried to blame it one ME, the WEATHER, the humidity in my home, etc. Come on! I have been using polymer since 1991 – probably before most of their employees were even walking yet! I am trying desperately to find affordable alternatives. My favorite so far, while NOT affordable, is the Pardo line. Until then, I will stick to my OLD Premo and Fimo and hope the heck someone out there reformulates with artists (instead of kids) in mind so many of us can resume our art. My experience is similar you yours… I think the formulas have changed and the old ones were much better. I’m disappointed but trying to make the best of what they have. I’ve been investigating Pardo also. I highly recommed taking one of Carol’s classes. I had the pleasure of taking one of her classes for intricate caning and I had many aha moments. Little things that will take my claying to the next level. Thank you Carol for opening your brain to us this past weekend!! Can’t wait to get out of work so I can clay around. 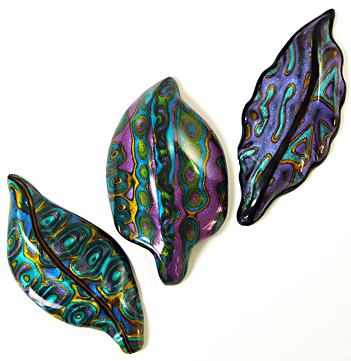 I saw these mokume gane pieces in person and they are fabulous–I would recommend taking her classes. It will be worth your time and money. Thank you Andrea! I thoroughly enjoyed teaching your group. Wonderful artists and great people! Adore your work. 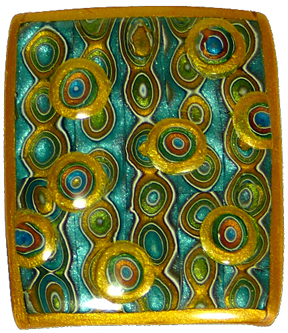 Have you considered a video of your workshop on metallic Mokume Gane so that those of us “down under” could purchase it? I’m afraid a video is a few years off. Hi Carol, I just discovered your wonderful talent and I’m sorry I did not know sooner that you were in France last October. I live in Avignon and I am a polymer lover .. I would have loved to follow your course. could you please tell me if you have tutorials I could purchase ? 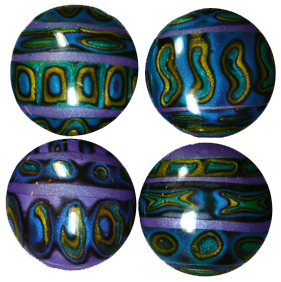 I am particularly interested in egg covered with polymer clay. thanks in advance for your answer and again.. your work is simply amazing..
Hi Carol, I subscribe to your newsletter so I know you plan to come to France in 2014. Saint-Guilhem-le-desert is about 2 1/2 hours from my house but 2014 is a long way from now.. you did not tell me if you have any tutorials on video or in writing for sale ? I would love to purchase one. I’m sorry, all I have at this time is my blog. I have a hard time even keeping this up. I hope I’ll see you next spring.